Mr Obafaiye Shem aka "My Oga at the Top" Has Been Finally Replaced! Mr Obafaiye Shem who was behind the 'My Oga at the Top" joke has been replaced with Mr Adesuyi Clement from Oyo state as the commandant of the Lagos state branch of Nigerian Security and Civil Defense Corps (NSCDC). 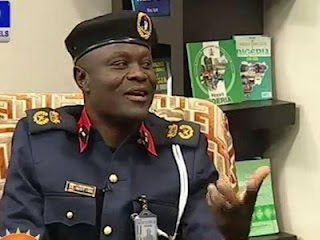 Dr olu Abolurin, the commandant general of NSCDC, whom Mr Shem referred to as the 'Oga at the top' introduced the new commandant to journalists as he addressed the alleged killing of two of his officers by some policemen in Lagos over the Easter weekend. No reason was given by him for Mr Shem's removal. pls note that he was not sacked.